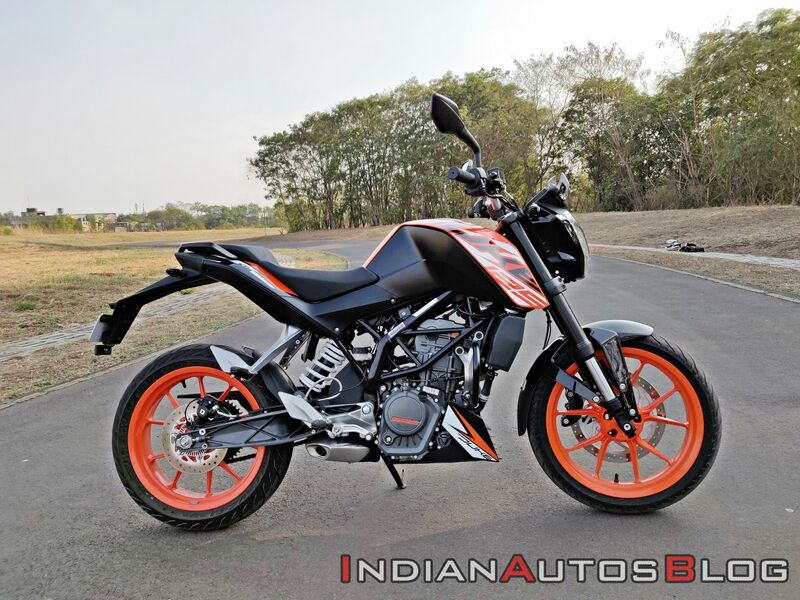 KTM launched the 125 Duke in the Indian market back in November at an ex-showroom price of INR 1.18 lakh. Readers asked where does the motorcycle fit in the Indian market? More importantly, why introduce the bike now? KTM officials told us that the initial years were targeted to establish the brand. Now, after creating a place for itself in the 200-500cc segment, KTM aims to attract the attention of entry-level buyers with the 125 Duke. The KTM 125 Duke is aimed towards entry-level buyers who are stepping up from a 110cc scooter or commuter. The motorcycle looks identical to the 200 Duke but features different graphics and a smaller engine. Moreover, the Duke series (comprising the 200, 250 and 390) has moved up in terms of pricing. Back in 2012, I purchased my 200 Duke for INR 1.35 lakh (on-road Mumbai). Now, the motorcycle retails for INR 1.51 lakh (ex-showroom) for the standard model and INR 1.60 lakh (ex-showroom) for the ABS variant. 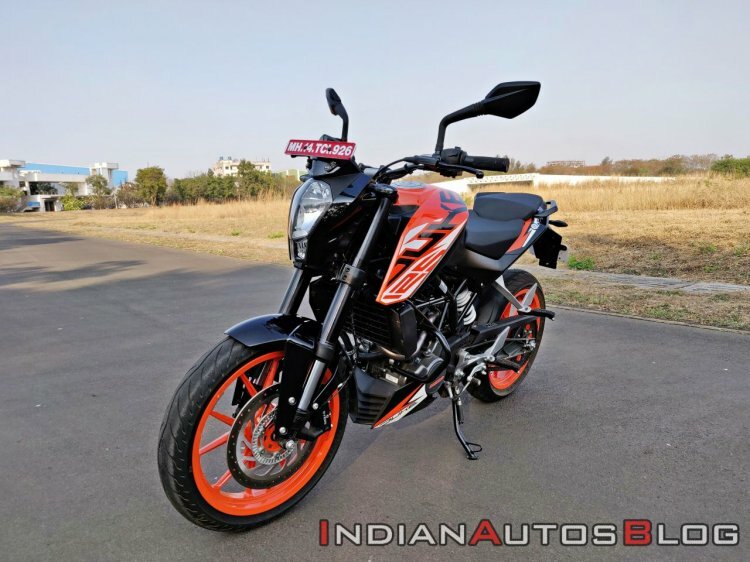 Thus, KTM 125 Duke makes more sense for the Indian market than ever. The 125cc model is INR 42,000 cheaper than the 200 Duke ABS. However, is the package good enough for that cheque of INR 1.39 lakh (on-road Mumbai)? While the international spec 125 Duke has received a massive design and feature list update, the India specific model is identical to the previous generation 125cc motorcycle and the 200 Duke. The idea to use the last model generation’s styling was to keep the prices competitive. The International spec 125 Duke looks identical to the current generation 390 Duke and packs features such as full LED headlight, TFT screen with Bluetooth connectivity and muscular styling. The India spec model, on the other hand, uses halogen headlight that is accompanied by a small flyscreen on top and LED blinkers on the sides. To add a variation from the 200 Duke, the 125cc model gets black headlight mask instead of body coloured units. The view from the cockpit, too, is identical to the 200 Duke. Thus, you would find a compact, orange backlit digital instrument console. The layout includes all the ride related information that is also seen on the 200cc model. The top of the screen displays the tachometer. The speedometer sits in the centre with the odometer and two trip meters on the right side. The left side of the screen shows the gear position indicator. Left bottom corner holds the temperature indicator while the right bottom corner shows the fuel gauge. The area below the speedometer shows a plethora of information that includes average speed, fuel consumption per 100 km, current fuel economy, ride time, distance to empty, and kilometres remaining before next service. The instrument console is identical to the 200 Duke and features all the ride related information on the compact, digital screen. The telltale indicators sit on the top and include a gearshift light. The right side of the console displays the ABS and a warning sign. The design of the fuel tank, rear panel, and the underbelly cowl are indistinguishable from the 200 Duke. However, the 125 Duke gets different set of graphics. The 125 Duke badges sit on either side of the fuel tank. Twin grab rails follow the split saddle with a step-up pillion seat. The rear features a LED tail light and LED blinkers. Sides reveal the compact underbelly exhaust instead of conventionally placed units on the international spec 125 Duke. The motorcycle uses the same trellis frame that also underpins the 200 Duke. On the contrary, the international 125 Duke (2017 onwards) uses a bolt-on sub-frame. The modern 125 Duke would have received more attention from entry-level buyers, but it would also have pushed the prices very high. The India spec model carries the hooligan look that swept many enthusiasts (including me) back in 2012. 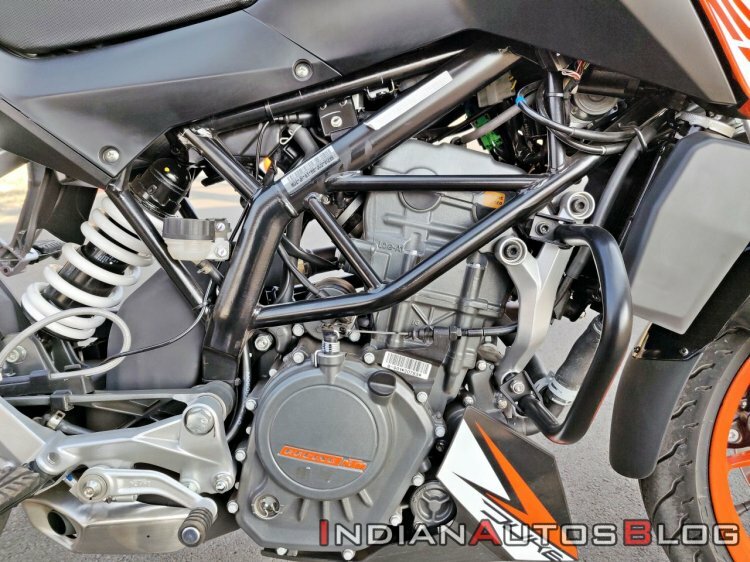 The motor is a re-bored and re-stroked version of KTM’s 200cc engine. The revised bore x stroke makes 124.7cc of displacement. The single cylinder, 4-valve, DOHC, liquid cooled fuel injected engine delivers 14.5 PS of maximum power at 9,250 rpm and 12 Nm of peak torque at 8,000 rpm. The engine is paired to a six-speed gearbox. The motorcycle is built around the same trellis frame that underpins the 200 Duke. The international spec model (2017 onwards) uses a bolted sub-frame. The engine is every bit KTM as it can get. It enjoys staying in the high rev range, and 7,000 to red-line is where you would have the most fun. Fourth gear can take you till 90 kmph while fifth will get to past 100 kmph before hitting the redline. We could achieve a top speed of 109 kmph on the back straight of Bajaj’s Chakan test track in sixth gear with a few revs to go. That said, the pace at which it gains speed past 104 kmph in sixth is slow, and it takes a while to inch closer to that 109 kmph mark. The six-speed gearbox is precise, to say the least, and we had no complaints. Stopping power comes from a 300mm single disc at the front and a 230mm single disc at the rear. The motorcycle comes with single-channel ABS while the rear features an anti-lift system that avoids a back wheel from lifting up under hard braking. The brakes are strong and can shed speeds at a commendable pace. The chicane at turn 3 and 4 of Bajaj’s test track demand heavy braking and the 125 Duke did not disappoint. Do note that the ABS and anti-stoppie system are always on and cannot be switched off. Does it handle as well as the 200 and the 390 Duke? The ergonomics are identical to the 200 Duke and the 125 offers a perfect combination of sporty, yet upright ergonomics. The tall set handlebar gives a comfortable riding stance while the relatively rear-set footpegs add a sporty feel to the ergonomics. Being a roadster, the motorcycle does not offer any wind protection. Shock absorption tasks are performed by 43mm inverted telescopic forks at the front and a 10 step adjustable 60mm monoshock at the rear. The suspension setup, similar to the 200 Duke, is on the sportier side, thus giving a lot of confidence while going around bends. The motorcycle, as mentioned before, is built around the same tried and tested frame that also underpins the 200 Duke and it is an absolute treat around corners. The MRF Revz rubber further complements the handling department. On the downside, the refinement levels could have been better as there are noticeable vibrations post the 7,000 rpm mark. The 125 Duke ABS retails for INR 1.18 lakh (ex-showroom Delhi) which puts it in a premium category against motorcycles with higher displacement such as the TVS Apache RTR200 4V and the Bajaj Pulsar NS200. The 125 Duke a perfect package for anyone who is planning to upgrade from a 110cc scooter or commuter motorcycle that has been in the family for more than a decade. The 125 Duke isn’t as wild as its bigger sibling but it isn’t a slouch by any means. It packs just the perfect amount of power to keep new riders engaged. The styling makes the overall package even more desirable. But there are a few problems for the motorcycle – its rivals, a premium price tag and Indian license system. Unlike European countries, India does not have different levels of driving licenses. Thus, riders are not restricted by displacement limits. Anyone with a valid two-wheeler license can buy a motorcycle ranging from 100cc commuters to over 200 bhp monsters. Moreover, the KTM 125 Duke ABS retails for 1.18 lakh (ex-showroom). The high price tag is a result of premium hardware such as upside down forks at the front, liquid-cooled motor and ByBre braking setup. 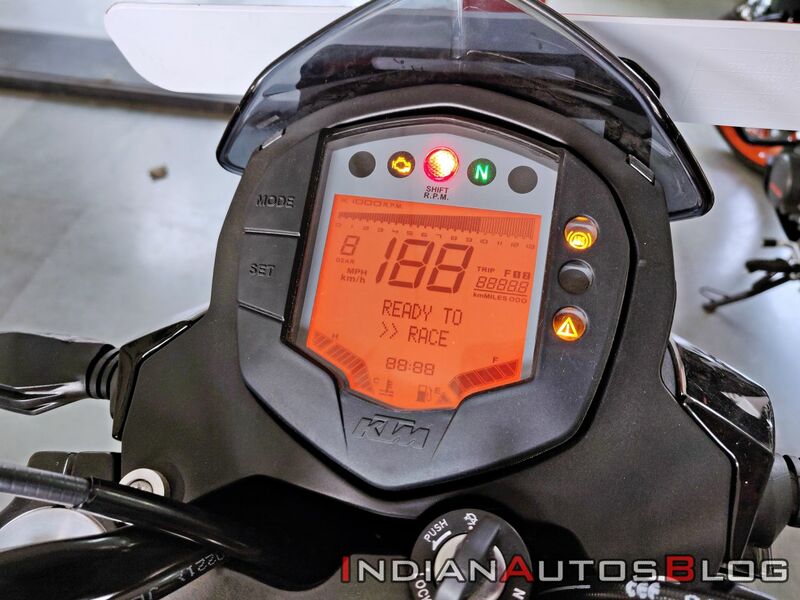 There are 200cc motorcycles in the Indian market that retail for lower price tag than the 125 Duke and the Indo-Austrian product will have an uphill task of competing against the likes of TVS Apache RTR200 4V and the Bajaj Pulsar NS200.